The United States has reassured allies in Asia that its pledges to the “critical region” remain the centrepiece of its foreign policy. “No matter how many hot spots emerge elsewhere, we will continue to deepen our enduring commitment to this critical region” said US National Security Advisor Susan Rice during an address at Georgetown University. 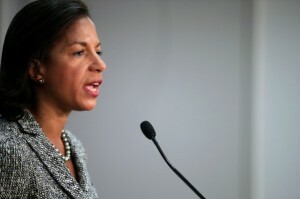 Rice outlined the Obama administration’s rebalance to Asia, dubbed as a “cornerstone” of its foreign policy. US President Barack will visit Asia in April to strengthen ties across the region, said the national security advisor. President Obama had cancelled an October trip to four Asian nations and two regional summits due to the US government shutdown. The “Pivot to Asia”, one of the Obama administration’s central foreign policy initiatives was announced during the current president’s first term in office. Obama’s “near term” goals include lasting progress on enhancing security and 60 per cent of the US fleet will be based in the Pacific by 2020, said Rice. “Our military presence in the region is vital, not only to deter threats and defend allies, but also to provide speedy humanitarian assistance and unmatched disaster response,” said Rice, citing US military aid to typhoon rescue operations in the Philippines. In line with the latest realignment, Rice announced that US Secretary of State John Kerry, who has been heavily involved in the Syrian dispute and the Middle East peace talks will return to Asia in December this year. “America’s commitment won’t expire a few months or few years from now,” she said, claiming that the United States will be a reliable, constant, strong and steady being in Asia for the long haul. The rebalancing strategy of the US has been criticised by Beijing as a bid to contain the rising economic and political clout of China. China has become the largest trade partner with most Asian countries and its direct investments in the region are surging. According to the China-ASEAN Business Council, Chinese companies invested $4.42 billion in Southeast Asia last year, up 52 per cent from 2011. A white paper on national defence released by China’s Defence Ministry in April said the US “pivot” to Asia runs counter to regional trends and “frequently makes the situation tenser”. “”There are some countries which are strengthening their Asia-Pacific military alliances, expanding their military presence in the region and frequently make the situation there tenser,” the ministry report said. Rice, however, sought to downplay those concerns by saying the US seeks a new model of ties with China including deeper cooperation on issues of common interest, such as the denuclearisation of the Korean Peninsula. Rice also welcomed China to join the US-led TPP trade agreement. ‘We welcome any nation that is willing to live up to the high standards of this agreement to join and share the benefits of TPP – and that includes China,’ said the national security advisor.